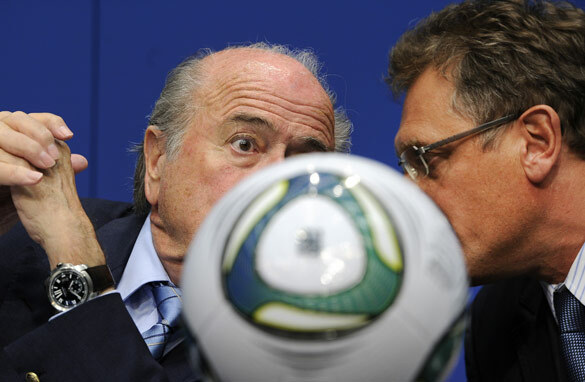 Sepp Blatter listens to FIFA general secretary Jerome Valcke during a press conference on May 9, 2011. For those of you slightly confused or even overwhelmed by the stories emerging from FIFA headquarters in Zurich this week, we understand your pain. Fasten your seatbelts and let us try to tell you what is at stake. On Wednesday the body which runs world football, FIFA, will vote for its new president. The incumbent Sepp Blatter is favorite to land the job, largely because he’s the only candidate in the race. But this is the most senior job in world football, so why has an election to a post of such importance attracted fewer candidates than the campaign to become student union treasurer at my local college? The straightforward answer is because the only other candidate in the race, the Asian football chief Mohamed Bin Hammam, was suspended on Sunday from football activity along with FIFA vice-president Jack Warner. They are being investigated about allegations that envelopes stuffed with cash were offered to football bosses in the Caribbean earlier this month as Bin Hammam was on the election trail. Meanwhile, Blatter was cleared of wrongdoing and is free to stand. But the real answer lies much deeper than this. You have to look at the system and not only the men in charge. Yes, we need to sweep through FIFA’s corridors of power with an extremely large broom if we are to effect change, but reform should not stop there. There is something systemically wrong when an organization which runs the world’s biggest sport and controls millions of dollars in TV revenues and sponsorship permits a small number of individuals to make most of the big decisions. There is little or no accountability, no evidence of transparency or even fair play. At the vote – the secret vote – to decide where the World Cups in 2018 and 2022 would be staged, most delegates agreed England were favorites for the former and either the U.S. or Australia for the latter. But logic and the technical quality of those bids did not sway the jury – so what did? One suspects the morals of a saint would be severely tested if afforded the status of FIFA executive committee membership. These decisions have caused anger and outrage, and unleashed a sea of claim and counterclaim, allegations of corruption and several investigations both inside FIFA and abroad. But on Monday Blatter boldly announced to the world’s media that there is "no crisis." This at a time when Blatter has had to explain why he spent $1 million on development projects while on the election trail, and the general secretary Jerome Valcke has had to "clarify" what he meant when he said Qatar "bought" the 2022 World Cup. He didn’t mean it, he explained, after his comments in an email were leaked by Warner, a temporarily suspended colleague and possibly former friend. The allegations of corruption against the men running world football have been relentless. In fact, the growing number of accusations of corruption against senior members by fellow senior members and organizations which they represent or do business with has actually become difficult to monitor. But surely in light of these allegations and the chaos surrounding FIFA, the election should be suspended, at least until the other candidate has finished his suspension, or more time is given for an alternative candidate to emerge? Good question. But not in FIFA-land, not in the place where due process has been properly observed and there is nothing wrong. Again, they are hiding behind a systemic failure. We’re way past comparisons with crooked corporations and corrupt councils - FIFA is now unhappily in a farcical league of its own, and all it can do is bury its head in the sand, claim that all is well and ignore the deafening calls for reform. They have come from many quarters, but FIFA cares little for such disrespectful comment. Politicians from Australia and England – where a sense of fair play is felt so keenly – and the English Football Association are among them. But they’re missing the point. FIFA's elite, and Blatter in particular, have shown they care little for this criticism, saying they are playing by the rules. Now some of FIFA’s key sponsors have expressed concern about the situation. Never mind the media, politicians and fans, it will be interesting to see how the system reacts to a potential threat to its financial security. Shame on FIFA for receiving cash bribes from Bin Hammam to buy Qatar World Cup 2022. Shame. The world's greatest sport on the greatest stage in some of the most beautiful venues on earth and FIFA fat cats in their greed had to ruin it for all the millions of us who love the sport.They are so out of touch with the fans that they not only don't care they will move right on with more of the same. I agree Kanu, it's shameful... says allot about the internal culture of FIFA. Its time for a change..........I hope it stays in Zurich........this is going to be fast moving week at FIFA. Blatter himself is not clean. I don't believe he is. why is he bent on a fourth term? I have been a US national team fan for over 20 years. I have watched the sport grow in the USA since the 1994 world cup and the creation of MLS that has pushed the sport into the spotlight across several states from coast to coast. Getting the world cup for 2022 would have been a tipping point for the sport in our nation and we had just about everyone under the sun pushing to bring it to our shores. The votes go up, QATAR?!?! A terribly small nation, one with no soccer history at all, one with not enough stadiums for the game to date. Not to mention the cultural clashes with the dominantly Muslim nation, westerners are in for some pleasant surprises, and some not so pleasant. Now corruption is all the way up and down the system of FIFA it leaves little doubt how Qatar got their world cup, they bought it, the greased several palms across the world with cash. This is a certainty because this nation, that has never done SQUAT as a nation for the game, is suddenly offering Barcelona's coach Pep Guariola over $30 million a year for a 4 year contract to be coach of their "national team". Which by the time 2022 comes around there will be several naturalized Brazilian/European/African players turning Qatari. War of the Worlds, we are all doomed!!!! why exactly id it suppose to be in the USA? "There is no crisis". Why didn't I think of that, dammit. There is little honour left in this sport, whether it be diving players or corrupt executives. I'm sure there was no corruption involved in giving the next two lucrative World Cups to Russia and a small, rich, extremely hot (40+ degrees in the summer) Middle Eastern nation...both known for their 'fair play'. Sepp is a joke, FIFA is a joke but I doubt much will change anytime soon. "There is no crisis". Why didn't I think of that, dammit! simple remedy, form a new World Football Confederation if there s no sweeping changes forth coming..
boycott their world cups is another way to make them change. It is now obvious that FIFA stinks of bribes and a very large expense account that is obviously not going back into the sport. Fifa should be disbanded and a new organisation elected. both venues are not football friendly. To understand much deeper what is happening, I would like international journalists to investigate and broadcast Republic of Benin football federation ongoing crisis, in which FIFA is messing up, by supporting corrupted people without any objectivity. They are all theft and must be jilted away from FIFA organisation. Fifa burns and all its officials are feeling the heat. before any election is to be held. Sepp Blatter or no Sepp Blatter at the helm is immaterial. FIFA must be FIFA...all who are tainted by the heat do not belong..
Blatter is the man to blame such a shameful and arrogant , evil, character. . Men like him give football a bad name, his attitude towards democracy is shocking . He was angry at the media and was hitting the table saying FIFA is not corrupt then days latter nigh ranking people are suspended for the same thing. later he has press conference were he arrives late and treats the media like pets and then says well its not my job to know if the executive committee is corrupt. what type of man is he ? he is either completely negligent or pure evil. i say the latter. he cares only for himself and this thugs. worst person ever. we want refs to camera replays in matches! This way there will be less room for divers and controversial decisions! Please make it true at least before I die (I'm 26)! FIFA and the Catholic Church make use of the same management consultants. I am an old person and I think you should replace this group of bitter old men with experienced 40 somethings to reflect the celebration of sports which this game is all about. I think Sepp Blatter should be suspended right away.A tempory President insatalled (Dr. Theo Zwangiger ) would be my suggestion. I would then have a rotating Presidency for each continent of two maximum four years.This to be determined by a LEGAL & TRANSPARENT ELECTION. There may have been corruption behind the Qatar win, but for those of you who think this must be so because the choice makes no sense, you are mistaken. For years, Qatar has promoted sports and has wanted to be a sports center for West Asia. They have hosted the Asia football federation finals twice, in 1988 and 2011 and hosted the Asian games in 2006. Not to mention all the other tennis tournaments, motor sports, etc. So it is not that far fetched. With that said, I think Blatter is an idiot and the entire Executive Committee should get the boot. It´s time to abandon FIFA and its corruption – and start to build a new organization. Walk away from FIFA and start again. All member countries should boycott or abandon it totally and start at new one.... hmmmmm. WFA? World Football Association. Blatter must be damned happy to have gotten rid of his competitor. Now no one can challenge him. A total walkover. what a joke fifa. This is not the NFL with commercial franchises. This is an international association with countries as members. If Spain, Italy and Brazil decided to start a new organization, who wouldn´t follow? This article would have been better if it included an explanation of who can votes in FIFA elections. I posted here links to an investigation documentary (on Youtube) on this issue, by the most respected BBC Panorama. Watching that documentary sheds light over how FIFA is a very powerful obscure organization. And for how long FIFA has been under suspicion. It is not a new problem that takes mister Blater by surprise. The documentary can be found searching "fifa bbc panorama" in Google, under video. For some reason, without any explanation (I provided my email address), my comment was removed by CNN moderators. I believe readers should know this fact. How do you vote when there's only one candidate? Someone pleeeeeaseeeeee tell me. Hasn't he got any decency. What a bunch of hypocrites. Accusations of nepotism, bribery and other unlawful practices are not new in large international organizations and bodies. Hopefully FIFA's internal disciplinary rules and regulations offer some remedies. Alternatively and depending on the gravity of the act, Switzerland's ordinary criminal system (prosecutor and court system) enter into play. It would be interesting to know FIFA's exact legal status. It is ironic that Sepp Blatter has (if I am not mistaken) a legal education and background but this may be of help to make all necessary reforms so that such scandals never happen again. All football fans around the world hope that FIFA's reputation can be saved and rebuilt. Right now, its reputation is totally demolished and so is Qatar's. Duuuuh – this is the same corrupt, archaic body that wouldn't allow basic instant reply goal-line equipment into the game which has already been adopted in most of the rest of the world. I remember they didn't care then despite the outcry – so why should they care about corruption – unless it stinks so badly that the whole world takes note? Americans are braying like sore losers,. they should stop this rubbish. The FIFA world cup is vast and honest, quite different from the massive corruption & doping of MLB, NBA & NFL. why hasn't the int'l media published info about J A Warner; that he is an active member of parliament in T&T, holding the largest portfolio,acts as Prime Minister in her absence (which is often) and is nicknamed the "real prime minister", the minister of everything and everybody, and a grand "welcome home" party is planned for him by his government friends on his arrival at the airport when he returns from Zurich tomorrow night. Ironic that Americans are bleating about Qatar "buying" the 2022 World Cup. The Olympics in Atlanta and Salt Lake City ring any bells? Each were bought with a healthy dose of corporate greenbacks. And therein lies the solution to the current crisis, because the only ones with the power to sweep FIFA clean are the sponsors. FIFA is a money-making machine, and one of Blatter's biggest successes is to turn football into a cash cow for the governing body. Therefore, given the mercenary nature of the organization, the prospect of its massive revenue being reduced would soon effect a change in corridoors of power. Hit'em where it hurts - in the wallet, it's their only achilles heel. Footbal is meant for entertainment and bringing friendship to d world..why are some people changing the image.b careful. The way fifa is being run reminds me of how some numerous politicians here in Africa run their respective countries-corruption,corruption, corruption.Fifa reeks of it from the top to the bottom.Football is beautiful it doesn't deserve all of this bull...! yes, yes, yes, we're all bitter, arrogant, imperialistic sore losers here in England and how dare Septic Bladder have the temerity to give the World Cup to anybody other than the motherland of football. Yes, FIFA do good work. They've donated millions to football projects which mean that smaller countries can now afford to run a national team and have equipment and facilities that before were just a dream. However, the fact remains that 4 members of the FIFA executive committee have been suspended and numerous other questions with regard to corruption remain unanswered. I don't believe for one minute that these were suitable grounds on which to go ahead with a presidential "election". The English FA, for all it's faults, deserves to be applauded on this occasion for having the courage to stand up to Blatter and his cronies. I'm sure the "smaller" countries will applaud his re-election...just as South Africa cheered when they won the right to host the World Cup. Although I wonder how they feel now having hosted FIFA's showpiece event at enormous expense and watched as Blatter's gang descended on the country for 4 weeks, sucked up all the profits and then left South Africa footing the bill with a bunch of stadia they are unlikely to use to their full potential ever again. I am a Swiss but live in AP. I totally agree. Definitely time to go for Sepp and all these corruption, bribes, bad news should be investigated by a independent body. Unless this can happen there will be no peace in FIFA. He should see that and do the right thing, appoint an interim body to control FIFA, stay on the sideline and cooperate with the inestigations. The media is missing a potential blockbuster story' The EU warrant for the arrest of Dr K the butcher of Cambodia ,on charges of genocide, is still active. Football is in the contrlol of self serving gangsters and its the financial sponsers who hold the key to cleaning-up Blatter's corrupt mess and deposing him and his cronies . Long live our beautiful game and may Blatter and the rest of his mob get the justice they deserve for the damage they have done. i just dislike this parasite . he´s a greedy old man who´s wears Glasses with dollar signs on them.. and could not give a monkeys nuts about anyone as long as he ( and FIFA !!!!!) has made some cash ! ITS ABOUT WHY/ WHERE / WHAT YOU DO WITH THE MONEY YOU MAKE !